A Canadian radio telescope located in British Columbia (B.C) has been reported to have captured some radio bursts from outside of our Milky Way galaxy. The Canadian Hydrogen Intensity Mapping Experiment, also known as CHIME has been searching for these sort of bursts for around a week and actually came across them. It's something that many people would not have expected given the vast distances in space. 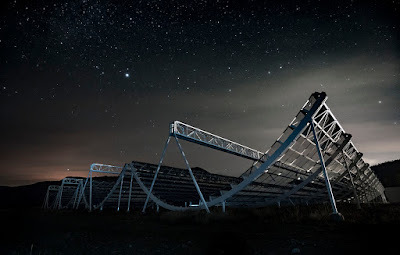 The type of radio wave that was picked up is an FRB (Fast Radio Burst). These really only last for milliseconds. Since CHIME is fairly large, it might be able to pick up a lot more of these FRBs, which means that we might be able to learn more about the great beyond. However, while it may pick more FRBs up, we'll still need to figure out if they're useful messages or just random bursts that have been let out through space. Some people think that it's extraterrestrials that have sent out these FRBs, others say it's a black hole or just a neutron star. The fact is, we currently don't know the exact origin of these radio bursts as of yet. That doesn't mean that something like CHIME isn't going to help research into the world of space. It's actually going to help scientists out a lot, especially if it can provide many FRBs. In short, it will basically allow more evidence and research to go into several different FRBs, which in turn would simply allow for more knowledge to be gained from them. CHIME was first turned on last year and began collecting radio waves for scientific research and understanding. Apparently, the functionality to capture FRBs was added after the initial starting time of the telescope.